SQUAREST OF THEM ALL Collins and Roberts play the simpery princess and her evil stepmother in the latest retold fairy tale. As the end credits of Mirror Mirror roll, the whole cast prances and sways into a Bollywood-style dance number, and suddenly it’s clear what the movie needed: more of that. This family film comes off as a medium-clever stage musical transferred to the screen, but something’s missing. Some would say it’s action. While its humor evokes the Pirates of the Caribbean movies, Mirror Mirror lacks the hectic, expensive busyness that made them hits. (Here, an acrobatic attack by little people on stilts passes for a big action scene.) Explosions might have vouchsafed the flick a bigger box-office take, but this critic would have preferred the inclusion of another missing ingredient: musical numbers. Mirror Mirror was directed by Tarsem Singh, who can be counted on to make films so visually sumptuous that you want to live inside them even when the rest of them is risibly terrible (viz last fall’s Immortals). 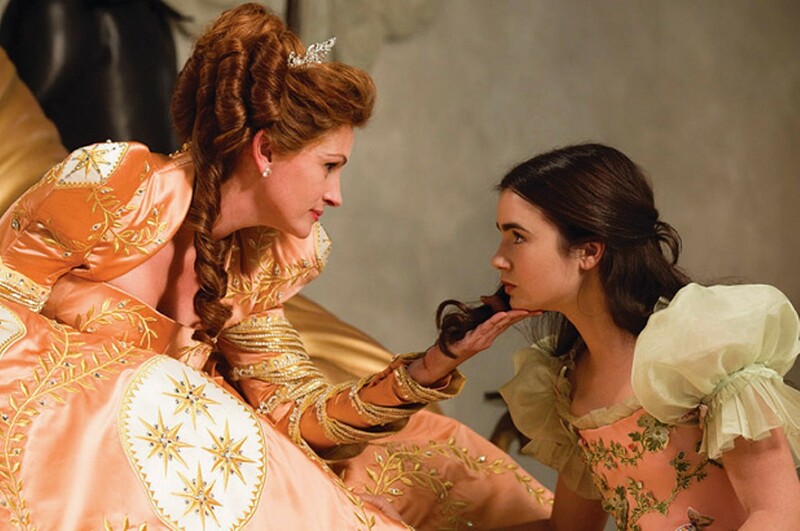 It has a striking look missing from other recent filmic fairy-tale retellings, like an animated series of illustrations for a mod-era edition of the Grimms’ “Snow White and the Seven Dwarves.” Snow (Lily Collins) and her nemesis, the Queen (Julia Roberts), rock floor-length, buttercup-yellow satin capes, puffy sleeves, Elizabethan collars and outré color combinations. The settings are spectacular and static, like painted backdrops: the Queen’s throne room opens on the clouds, as if she ruled the whole cosmos (shades of Bergman’s The Magic Flute), and the dwarves inhabit a birch wood clad in seemingly perpetual snow. In this version, the Queen is still vain; she condemns Snow to death for derailing her efforts to wed a prince (Armie Hammer) some years her junior. But she doesn’t bother asking her mirror who’s the fairest because she knows it doesn’t matter as long as the fairest is clueless and ineffectual. Finally, our villain has become the 1 percent, bleeding funds for her frivolities from the peasants. When Snow reaches the forest and enters the tutelage of the seven dwarves — now a fierce bandit gang — her story takes a Robin Hood turn. The script is rich in silly humor, but it exercises restraint in pandering to a younger audience. (Translation: It’s light on the fart jokes.) The dwarves have distinct and colorful personalities, while Hammer delivers an uninhibited comic performance reminiscent of a young Brendan Fraser — he’s ridiculously handsome and ridiculous, period. Roberts dials it back more; her dry Queen suggests a seen-everything divorcée stirring up trouble on “Desperate Housewives,” not a psychotic enchantress. But she’s still amusing, as is Nathan Lane as her dithering chamberlain. Collins is no Amy Adams, but she looks her sketchily written part, and manages to be alternately simpery and plucky (toward the end, happily, the pluck takes over). Kids expecting something like Tim Burton’s Alice in Wonderland may find Mirror Mirror slow and claustrophobic, while adults are more likely to appreciate its over-designed world. There’s something so excessive and un-Hollywood about Singh’s visual sense that it’s easy to imagine a crazy Disney-Bollywood-Wizard of Oz hybrid struggling to escape from the constraints of this focus-grouped, tween-targeted film. And I, for one, would like to see that movie — with singing.